Grand Knight - John Bodoh, Sr. 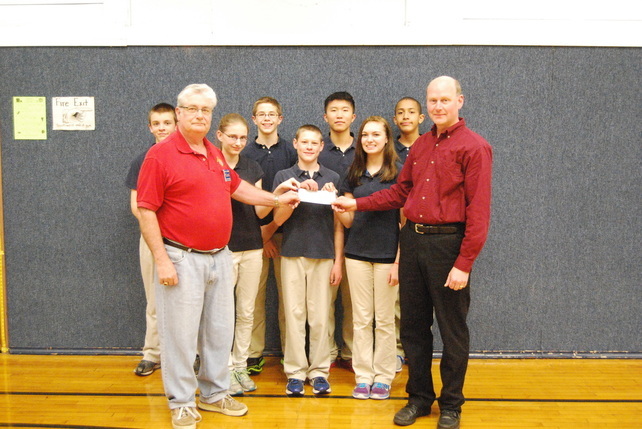 Faithful Navigator - John Bodoh, Sr.
Elvin Tanner, left, Financial Secretary for Father Otto Weber Council #2639 of the Knights of Columbus, presented a $4,000 check to St. Anthony School Principal Steven Eitrem and 8th grade students, from left, Joe Wagner, Miranda Lobermeier, Jaedyn Eder, Ethan Weber, Jason Chao, Brianna Schmidt, and Thomas Harris. 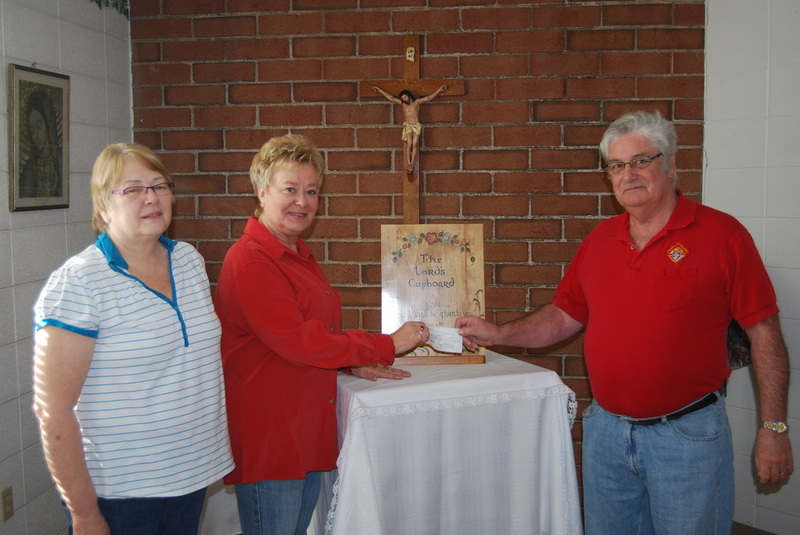 The donation fulfilled a pledge the KCs made to the St. Anthony School Annual Fund. ​Elvin Tanner, left, Financial Secretary for Father Otto Weber Council #2639 of the Knights of Columbus, presented a $1,200 check to St. Anthony School Principal Steven Eitrem towards repair of a section of school roof. The KCs raised the funds through food and beverage sales at the Park Falls Area Chamber of Commerce's Ruffed Grouse Fall Festival. Lud Miller, formerly of Fifield, and his wife, Ann, visited Fr. James Jackson Hall, home to Fr. Otto Weber Council #2639 of the Knights of Columbus, during a recent visit to Park Falls. Lud, whose grandfather, Ludwig, was a member of the council, had previously presented to the council the cross on the mantel, which had adorned the desk of Fr. Weber. Lud's father, Tony Miller, was also a member of Council #2639, as well as a 4th Degree Knight, having served Fr. Otto Weber Council as Grand Knight. Lud and Ann live in Fredonia, WI. Elvin Tanner, Financial Secretary of Knights of Columbus Fr. 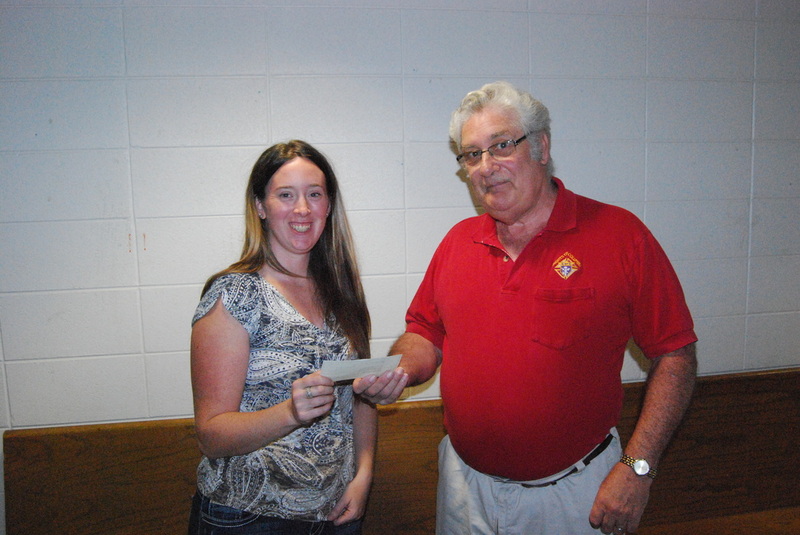 Otto Weber Council #2639 of Park Falls, presented a donation of $300 to Stephanie Hirtreiter, director of St. Anthony's Daycare, to be used for purchase of children's books for the daycare. Elvin Tanner of Fr. Otto Weber Council #2639 of the Knights of Columbus presented a check to board member Lynn Kundinger, left, and president Ginger Feit of the Lord's Cupboard food pantry in Park Falls to help the pantry stock its shelves for Thanksgiving and Christmas. The KC council also made donations to the community Thanksgiving and Christmas dinners in Park Falls. 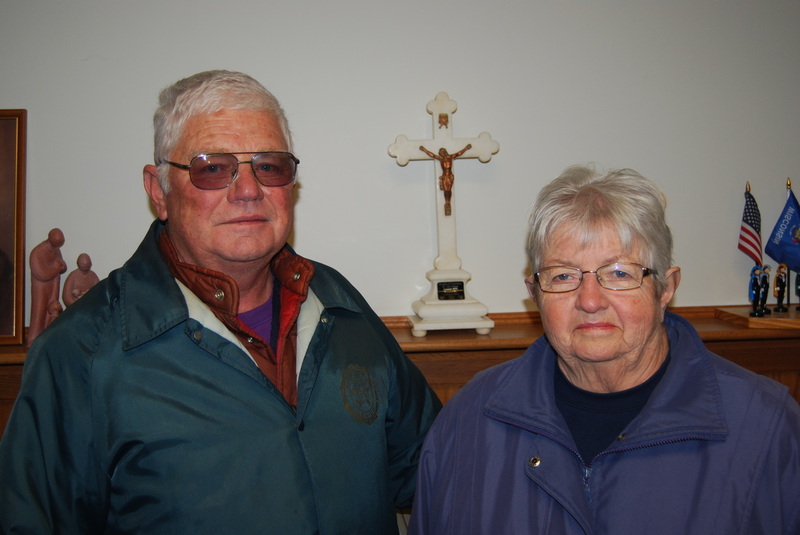 Father Otto Weber Knights of Columbus Council #2639 of Park Falls raised over $1,100 for St. Anthony Catholic School at its 2013 Pork & Dumpling Feed. 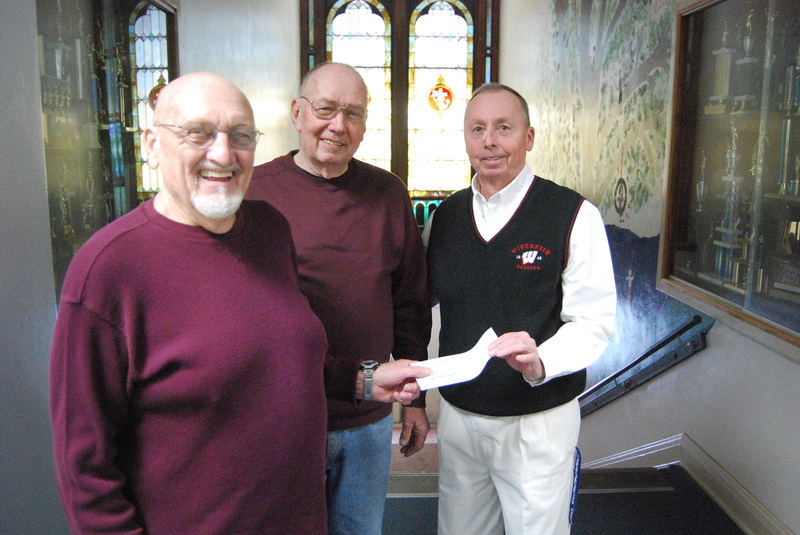 Bob Little and Don Leitl, from left, presented the proceeds to St. Anthony School Principal Michael Plemon. pregnancy centers with the modern technology to monitor the health of babies in utero, and to allow mothers to visually experience their development. Reports indicate that up to 90% of women considering an abortion choose to have their baby after seeing an ultrasound image. They hear their baby’s heartbeat, they see their baby’s head and fingers. They know it is a child, not a“choice.” Even from the early stages of pregnancy, a mother can see her developing child, hear the baby’s heartbeat, and to recognize the miracle of the new life within her. This is why the Supreme Council of the Knights of Columbus is funding half of the purchase of ultrasounds for this purpose. Each center must meet the faith, medical, insurance and fundraising components of the program. In September 2011, the Abiding Care Pregnancy center made an appeal to Medford Council 1744 for help in obtaining an ultrasound. Abiding Care Center joined with the Pregnancy Counseling Center in Ladysmith in early 2012 in a drive to obtain an ultrasound to aid in their ministries to women with modern technology to monitor the health of babies in utero, and to allow mothers to visually experience their development. At the July 2012 Wisconsin Knights of Columbus District Deputy Meeting, Ray Knapstein of District 85 said that the Minoqua Pregnancy Center would like to join the cooperative effort to bring an ultrasound program to Northern Wisconsin. All centers have since worked with the councils to bring this program to realization. Centers in Hayward and Rice Lake are working towards joining the program. From the start, the directors of the pregnancy centers recognized that each one of them could neither afford, nor fully utilize, a stand-alone ultrasound. It was also recognized that no one single council or even district could raise the funds for one, let alone three, ultrasounds. The circumference of the area that is served by these three Pregnancy Counseling Centers is about 420 miles, and when expanded, about 470 miles. The District Deputies of the area stepped up and guided the completion of the paperwork by the centers to approval by Bishop Peter Christensen of the Superior Diocese. Bishop Christensen did request that each of the centers submit a signed statement supporting the Statement of Faith Clarification for Catholics (CareNet) before receiving his approval. The District Deputies were instrumental in contacting the various councils to raise funds for this cause. Because the initial idea and initial contribution came from Medford Council 1744, and because the council had established a separate account for the Ultrasound Initiative, it was decided Council 1744 would be the sponsoring council. The various councils raised funds through fish fries, chicken barbecues, bingo, and contributions from their general funds. They made appeals to other organizations and individuals who were willing to donate to the Ultrasound Initiative. District Deputy Ray Knapstein of District 85 developed and raised prizes for a raffle with tickets sold throughout the state and Diocese. The fundraising began almost immediately, even before all the paperwork was completed. Initially, the goal was to obtain a portable 2d machine, but as the fundraising progressed, it was determined that a 3d machine, capable of 4d imaging, was affordable. At this time, enough money has been raised to pay for half of the portable 3d ultrasound, and the equipment each center will need to operate the ultrasound. The total funds raised to date are $27,742.05. The ultrasound is an Esaote MyLab 25 GOLD Portable Premium Performance Ultrasound Imaging System with a bid price of $49,900. 2066, Rhinelander 2032, Minocqua 3557, Eagle River 5415, and Mercer 7228. Additional contributions came from the centers themselves, and from other organizations. There are currently five other ultrasounds in the state of Wisconsin which are sponsored by the Knights of Columbus. All of them are located in a single center and sponsored by just a few councils in a single district. Abiding Care Pregnancy Resource Center, 123 W. State St., Medford, WI 54451; 715-748-1235. Care Net Pregnancy Resource, 1108 Port Arthur Rd., Ladysmith, WI 54848; 715-532-7600. New Dawn Pregnancy Resource, 8534 U.S. Hwy. 51 N, Minocqua, WI 54548; 715-358-6700.